$33.99 NOTE: Our shopping cart is disabled. We are using it to display affiliate items which if you click on PURCHASE in the PRODUCT INFORMATION by scrolling below or click on the Amazon banner the RRDi receives a small affiliate fee upon completion of your purchase. Mahalo. Purchase. Why Azeliac Acid for Rosacea? 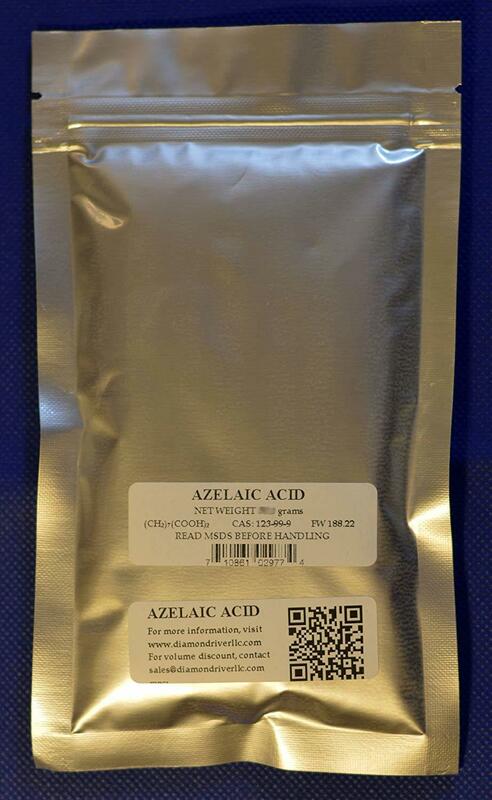 Azelaic acid is a natural substance that prevents some types of hair loss. It has been said that combining 15% of this product with the 5% minoxidil solution (widely available on the retail market such as Costco) can increase the effectiveness of the overall treatment process. You can make this solution yourself and save a lot of $$$. To make such a solution, you can measure ~10 grams of azelaic acid for each 60 mL (2 floz) minoxidil solution. Add a small amount of minoxidil solution into the powder and mix it into a uniform paste. Pour more solution into this paste and keep mixing until all solution has been added. You will end up with a well mixed final product. Shake well before each application.